Joel Walsman and Max Hanania finish up mounting Ironridge rails on one of the fire stations in Bloomington, Indiana. 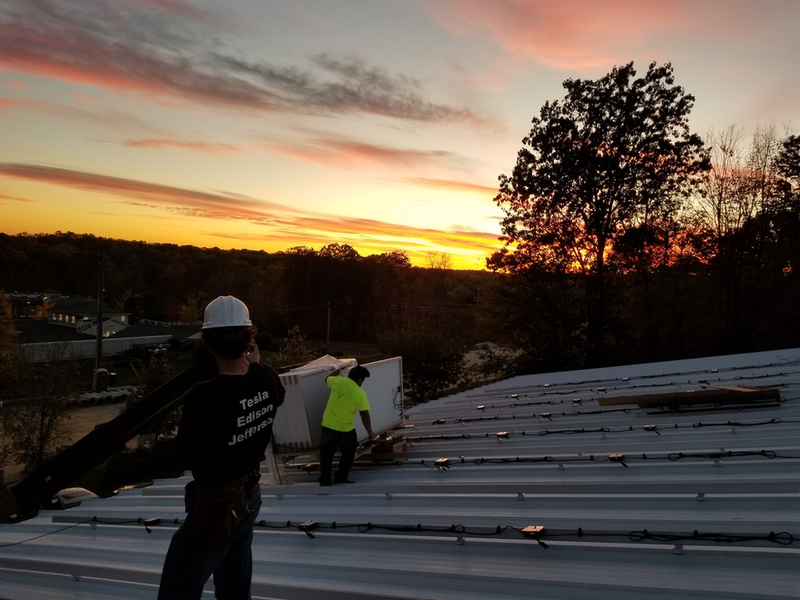 This has created a rush for solar energy in Indiana with the Solarize initiatives helping people get connected with companies who can design and install solar arrays. Here at Jefferson Electric, we have been busy responding to requests, designing arrays, redesigning arrays, scheduling visits, ordering inventory, and installing solar arrays on people's homes and businesses. While this rush may make the future of solar power in Indiana look dire indeed, do not fret. Next year the timeframe for net metering may be halved, but that does not mean all the benefits of solar disappear. 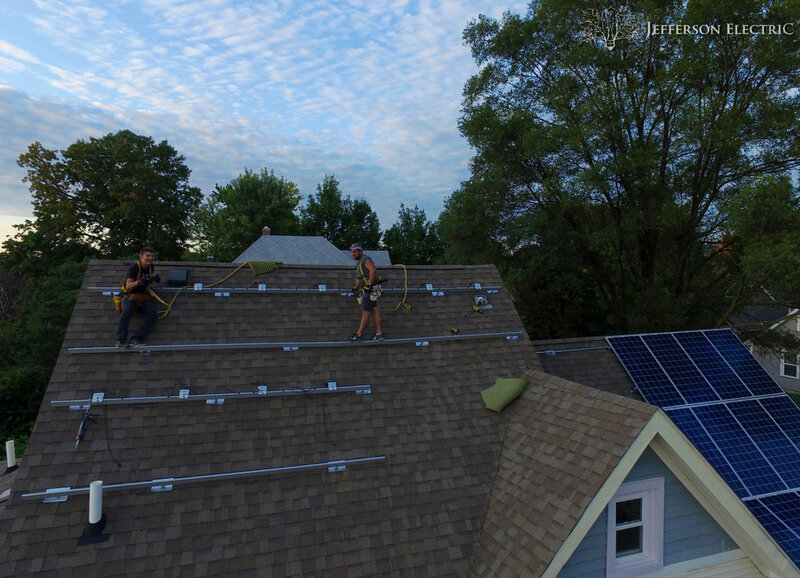 Zach Elliott (left) and Ryan Staley (right) work on installing the Ironridge mounting hardware for the Hanwha QCell 330 Watt solar modules that will be added the following day. Net metering helps solar arrays pay for themselves, but on a residence it generally only takes 7-12 years for a solar array to have completely paid for itself. From then on, you are saving money by not paying as much (or even any money) to your utility company. But, net metering isn't the only benefit of solar power. It's clean energy; it doesn't emit CO2 or other harmful gasses into the air. Instead, each kilowatt hour produced is equivalent to saving 1.5 pounds of CO2 from going into the atmosphere, and every 63 kilowatt hours, it's like you've planted a tree. Battery technology is also quickly advancing, making it possible to save your excess energy and mitigate the effects of the net metering bill. Besides all this, the energy comes from the sun! There's no need to expend energy to find a source of energy. The sun comes each day and its energy is harnessed, even on cloudy days. So, even if you aren't going to have a solar array installed this year, next year isn't too late in Indiana!